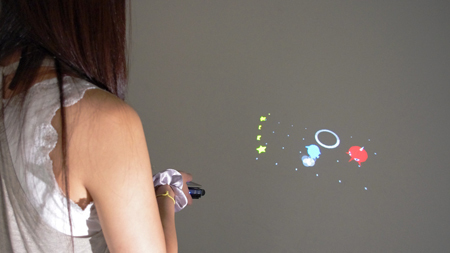 The MotionBeam project explores new forms of interaction using handheld projectors. Enhanced with a motion sensing system, the device allows users to interact with and control gaming characters by moving the device around. The interactions are based partially on fundamental principles adapted from animation and comic art, such as secondary motion and closure. This creates a unified interaction style in which the sensor input and projector output are tied together within a single device. Character and racing game applications show how MotionBeam can be used with mobile games. It can also be utilized for augmented reality by linking projected content to physical objects. MotionBeam has the potential to be a key component in a new ‘game projector’ platform where the real world becomes a playground and users interact directly with each other and the environment. The MotionBeam project was developed at Disney Research Pittsburgh by Karl D.D. Willis, Ivan Poupyrev and Takaaki Shiratori. 3D models and animations were designed by Keiko Nakao.